Briefly known as Stemmons, Texas, Chicago was first named in jest after the landowner�s hometown. The irony was that this Chicago had virtually no population compared to the �City of Big Shoulders.� But a post office for area ranches did open in 1889, and the postal authorities recognized the name, whimsical or not. A settlement did develop, necessitating a move of the post office in 1904. The joke was getting stale by that time and so the name was changed to Stemmons, after the surname of a ranch foreman. When Dawson County was organized, the two contenders for county seat were Stemmons and Lamesa. Stemmons had been ordered to close their post office, but in order to give the community a fair shot and not influence the election, postal authorities allowed the two post offices to exist until after the 1905 election. Lamesa won by a mere five votes. The Stemmons post office closed and the offer of help in relocation businesses was taken up by Stemmons residents. In the span of a few days in July of 1905, the community of Chicago / Stemmons became a historic footnote. 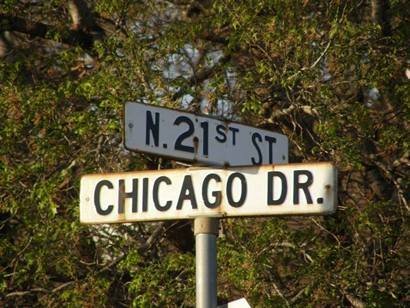 Chicago is remembered today by a historical marker and a Lamesa street named after the short-lived town. Lamesa, a city mostly set up on a grid of numbered streets and avenues does have a few streets named after cities. The mix is an interesting one, including Akron, Boston, Detroit, Flint, and Hartford � and of course, Chicago. W.C. Bishop of Chicago, Illinois, and wealthy lumberman George N. Fletcher established the Oto (later Bar To) ranch about 1887 on Fletcher's extensive landholdings in Dawson County. 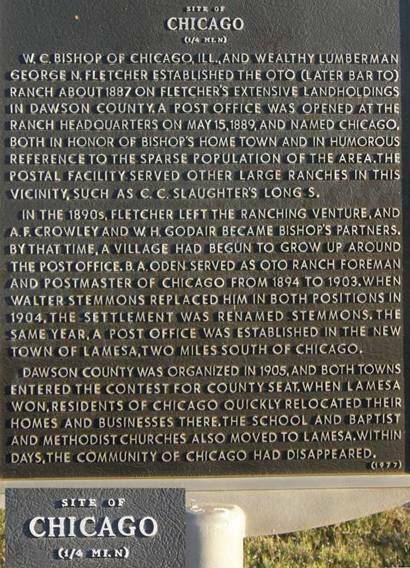 A post office was opened at the ranch headquarters on May 15,1889, and named Chicago, both in honor of Bishop's home town and in humorous reference to the sparse population of the area. The postal facility served other large ranches in this vicinity, such as C. C. Slaughter's Long S.
In the 1890s, Fletcher left the ranching venture, and A. F. Crowley and W. H. Godair became Bishop's partners. By that time, a village had begun to grow up around the post office. B. A. Oden served as Oto ranch foreman and Postmaster of Chicago from 1894 to 1903. When Walter Stemmons replaced him in both positions in 1904, the settlement was renamed Stemmons. The same year, a post office was established in the new town of Lamesa, two miles south of Chicago. Dawson County was organized in 1905, and both towns entered the contest for county seat. When Lamesa won, residents of Chicago quickly relocated their homes and businesses there. The school and Baptist and Methodist churches also moved to Lamesa, within days, the Community of Chicago has disappeared.